Charlie Edwards has quashed his summer recess blues with PMQ’s: the Game. A pixelated David Cameron and Ed Miliband go head to head, debating policy and making quips with one aim: to get a roar from their backbench colleagues. I am David Cameron. Ed Miliband is on his feet. He starts with a question about a Tory ex-Minister saying I lacked leadership. You choose between a “special attack” blaming everything on Labour’s mess or replying with a Cameron-esque quip. I chose the quip, “The Right Honourable Gentleman’s scripted lines may be very good, but he doesn’t lead his party with any script or direction.” Cheers from the Tory backbenchers. 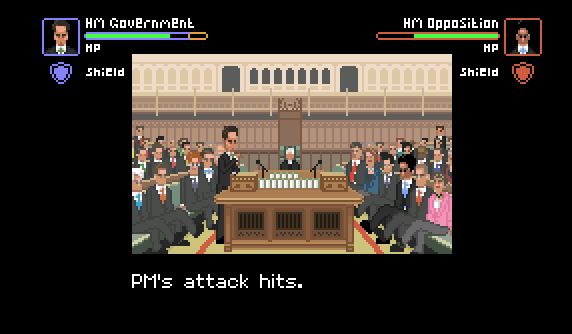 ‘Prime Minister scores a critical hit.‘ This game is starting to get good. The game was the brainchild of Mark Richards, who created the Pixel Politics blog, which provides topical political commentary in cartoon form, including an uncanny pixelated version of David Cameron’s forehead. The PMQs is an interactive version of the cartoons, and has all the potential of a 59p i-Phone app sensation. Watch this space, folks! A refreshingly addictive game, fun banter regardless of your political ideology. I am sure many will look forward to a future version from the perspective of Ed, but for now, it has wasted a good half an hour of recess. Perfect. Only four more weeks to waste now. Click here to visit Pixel Politics’ website. It is so worth it.